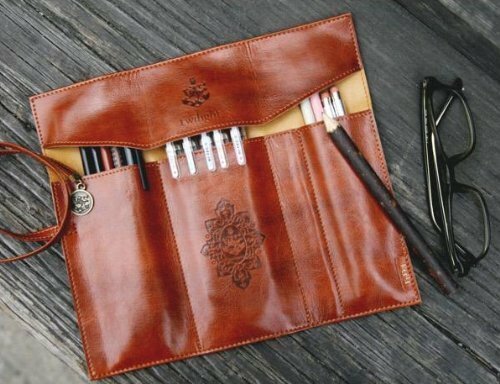 Leather Makeup Case Just $2.39 + FREE Shipping! You are here: Home / Great Deals / Amazon Deals / Leather Makeup Case Just $2.39 + FREE Shipping! Love, love LOVE this deal! Right now, Amazon has this leather makeup brush case priced at just $1.90 with FREE shipping! Material:High quality synthetic leather. Condition:Brand New. Fold Size:22cm X 9cm X 1cm. Unfold Size:22*22cm. Weight:26g. Foldable Bandage Close Light weight design,Feels soft and comfortable when use. Super Capacity for pen,pencil,cosmetic organizer. This is the best price I think I’ve ever seen, and you can use it for more than just makeup brushes – think pen or pencil holder!